The board has the day-to-day management of the Association. It consists of the following members: mr. P.C. Klein RI (chairman), mrs. Dr. I.A. Kuling (vice-chairman), mr. J. Smit (first treasurer), mr. G. Tosserams (second treasurer), mrs. M. Bierhaus (general member), mrs. I.C.W. Veldhuis (general member), mw. N.S. van Rossum, BAE (general member), mr. R. Feith (general secretary). 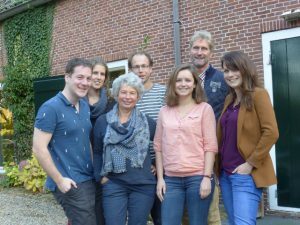 On the picture (left to right): Gerard Tosserams, Irene Kuling, Miriam Bierhaus, Jelle Smit, Ilona Veldhuis, Peter Klein, Nicky van Rossum.